Too many guitar players try to learn everything by themselves and end up frustrated because they get stuck, don’t know how to correct a mistake or develop bad habits that hold them back. Unfortunately, these self-taught players often end up quitting guitar altogether. When you take lessons with a great guitar teacher, you do not run into these same issues. A great guitar teacher keeps you on track towards becoming a better player at all times and does many things to make the entire learning process more fun. Without the guidance of a great guitar teacher, it’s nearly impossible to know what you should be working on in your guitar playing. Many self-taught guitarists practice in a random manner and never seem to get anywhere in their playing. Additionally, it is common for guitarists to practice everything they can find, causing them to become overwhelmed. A great guitar teacher uses his expertise to help you identify your musical goals and develops a lesson plan centered around helping you reach them as fast as possible. He not only shows you what to practice, but helps you put together a guitar practice schedule to ensure that you are always working on the right things to stay on track with your goals. Without a guitar teacher it’s easy to get stuck in your playing and not know how to move forward. When you take guitar lessons, your teacher quickly identifies any mistakes you are making to help you correct them. This eliminates tons of frustration and helps you avoid wasting your time trying to guess your way through the process of becoming a better guitarist. Additionally, a great guitar teacher shows you how to track every aspect of your playing. By tracking your progress on a consistent basis (such as every week), you better understand your strengths and weaknesses. When you know this, it helps you use your practice time more efficiently so you don’t spend too much time working on things you’ve already mastered. Having an expert to guide you through the process of getting better as a musician is crucial for your growth. Anytime you aren’t sure what you should be doing, how to fix a mistake or how to move beyond a plateau in your playing… your guitar teacher is there to answer your questions, coach you, train you and motivate you. The motivation you get from having this is well worth the price of admission, because it helps you push through in times when most guitar players give up. The act of pushing through in challenging times is what helps you grow into a much better guitarist. 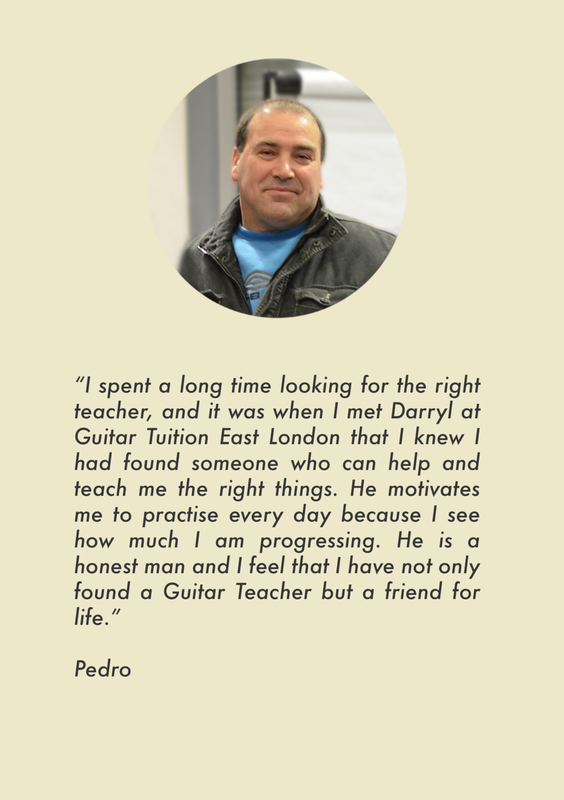 Get started with a great guitar teacher now by researching online and looking around your local area. While doing this, look for someone who teaches in your specific playing style, has proof that they’ve helped others achieve the goals you want to achieve and has excellent credentials directly related to guitar teaching. Don’t hesitate! As soon as you find this teacher, your skills will skyrocket and you will enjoy the process of improving on guitar more than ever.